It's 02:11 in Vacaville, USA right now. 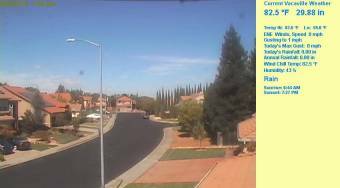 Vacaville Weather A webcam in Vacaville, California with image archive, weather data and timelapse videos. Davis, California: Chiles Road, 18.7 miles away. Concord, California: Calvary Temple Christian School, 26.3 miles away. West Sacramento, California: Harbor Boulevard, 27.7 miles away. Sacramento, California: Sacramento Skycam, 31 miles away. Sacramento, California: Mack Road, 31 miles away. Sacramento, California: Fulton Avenue, 31 miles away. Sacramento, California: Truxel Road, 31 miles away. Elk Grove, California: North of Sheldon Road, 34.3 miles away.